This might remind you of the Bento Box post I did back at the end of January. 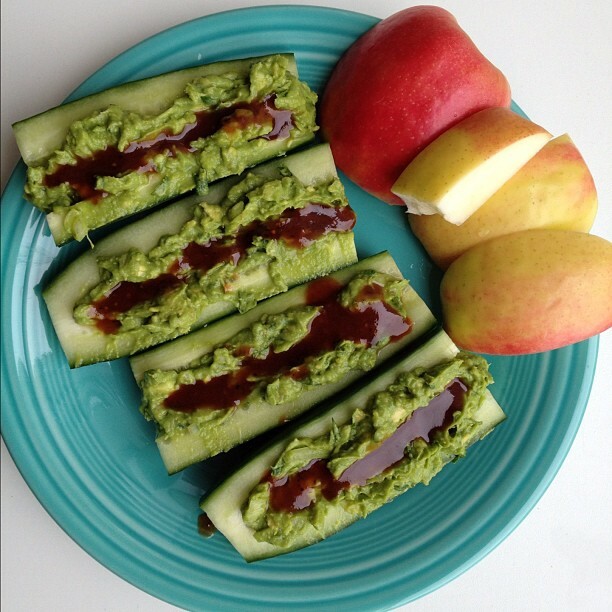 I have to say it is one of my favorite ways to eat an entire cucumber in one sitting! 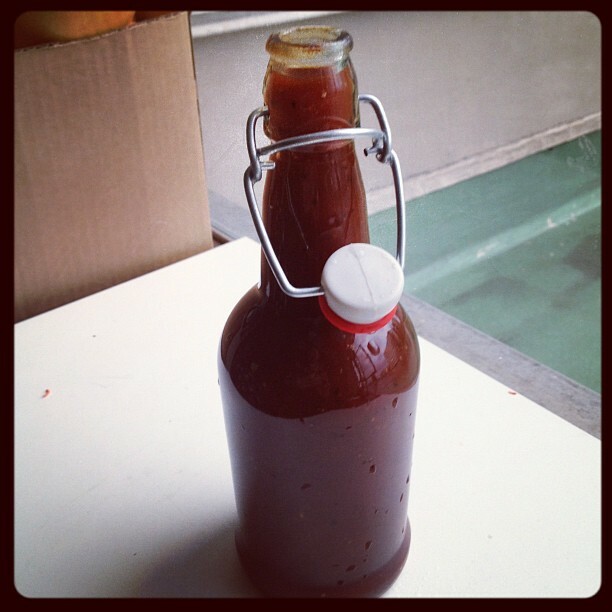 Today’s addition is a homemade barbecue sauce inspired by SimplyScratch.com. I’ve made a raw barbecue sauce before and it was also delicious but I didn’t want to wait for the dates and sun-dried tomatoes to soak. I will be making one in the near future though. This homemade barbecue sauce took less than 10 minutes to make and is delicious. It reminded me of Sweet Baby Ray’s but without the high fructose corn syrup. Her recipe called for brown sugar but I used organic evaporated cane juice, which I think made it a little harder to dissolve but the end result was perfect. If you’re interested in making your own bbq that isn’t raw, check out her recipe here. For a quick guac recipe that really just involves mashing up avocado and adding a little garlic powder, onion, salt, cilantro, and lemon juice – all to taste. 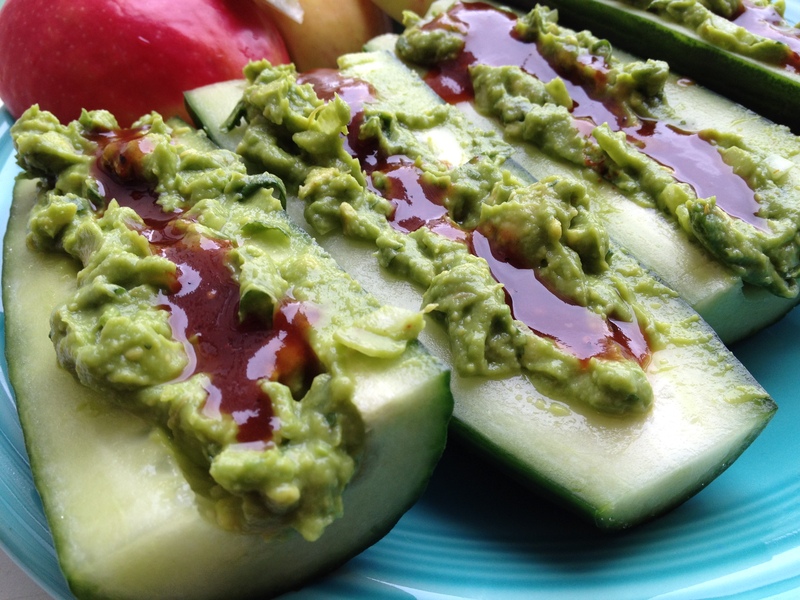 Then remove the seeds from your cucumber using a spoon or apple corer and fill with guacamole and a drizzle of barbecue sauce. End result…divine! To make for easy transport to work, keep the guacamole in a small container with saran wrap or wax paper pressed onto the surface to eliminate any air contact and cover with a lid. Then just fill your cucumbers at work. Cucumbers are super hydrating as well as filling and go perfect with the healthy fiber, fats, and protein the avocado chips in.